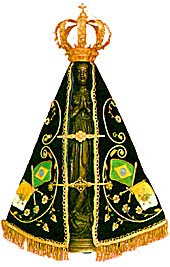 The history of Our Lady of Conception Aparecida begins in 1717, when news arrived that the Count of Assumar, Dom Pedro de Almeida e Portugal, Governor of the Province of São Paulo and Minas Gerais, would be passing by the village of Guaratinguetá on his way to Vila Rica, today the city of Ouro Preto in Minas Gerais. Three fishermen, Domingos Garcia, Filipe Pedroso and João Alves were sent out by the local authorities to find fish in the Paraíba River. They went down the river and found nothing. After many unsuccessful attempts they arrived at a place called Porto Itaguaçu. João Alves threw his net into the water and brought back a statue of Our Lady of Conception, but the head was missing. He threw his net in again and soon reeled in the head of the statue. After that, according to the legend, the fish arrived in abundance for the three humble fishermen and their nets were full. According to most sources the image had been sculpted by Frei Agostino de Jesus, a monk from São Paulo known for his sculpture. The image was less than three feet tall, was made around 1650, and must have been underwater for years. It is a dark brown color, is covered by a stiff robe of richly embroidered thick cloth, and wears an imperial crown which was added in 1904. Only her face and hands can be seen.